This is the new elekk mount obtained by pvp tokens in patch 2.4. You still need to buy 150 riding skill to use this mount. And no reputation requirements. 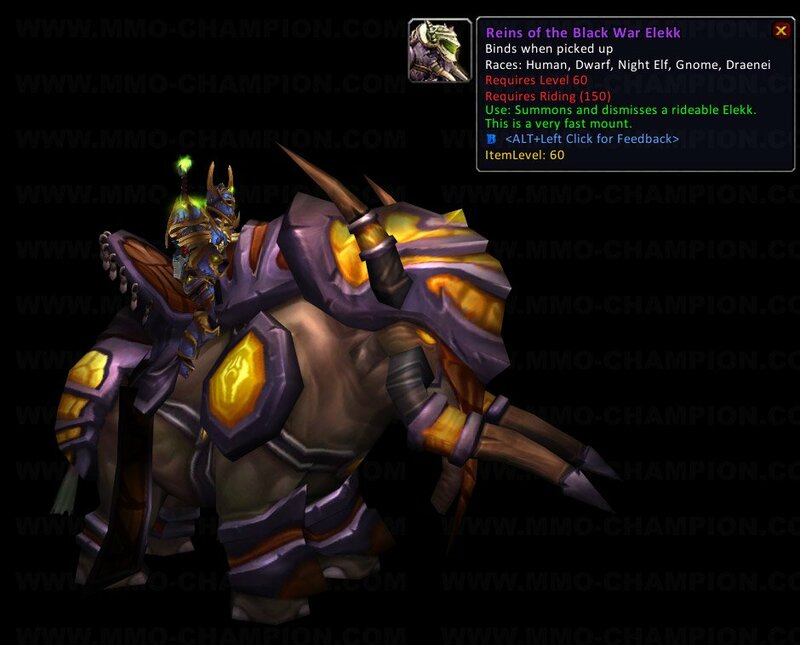 Here is what the Black War Elekk looks like thanks to mmo-champion. Looks more like an orange Elekk. Could easily be a mistake. My question is why did it take so long to get a PvP Elekk compared to how long it took to get a PvP Hawkstrider? The PvP Hawkstrider is being added in the same patch as the PvP Elekk. this is soooooooooooooooooo coooool . But, I will stick with my Black War Ram. It's definitely worth getting the pvp marks for versus spending 85g (and looks way cooler) especially since you'll rack up a nice amount of honor while acquiring the points. The War Elekk is definitely more ominous in appearance than the others sold by this vendor and you look more intimidating rolling up to an enemy player on this than you do on the others. Anyone else really peeved off that they spent hours getting Exodar rep and then this came out? why the heck have they put yellow thingies on it? thats the only thing which looks bad, everything else is kool! now it doesnt say how much faster it goes i am going to guess 100% faster but is that true or what? anyone know like they got bored and tested to see how much faster? This is the only Elekk mount available to players without the Burning Crusade, since it can be purchased in Stormwind. Do mounts change size depending on what race is riding them? Cuz I'm a gnome and I don't know if it's the angle that I'm always viewing it from, but it always seems like mine's bigger than everybody elses...not that I'm bragging. I use it to hide people with the flag in EotS. Lol. This is the greatest mount ever. Yes Mounts do change size depending on what is riding them. Although I've only noticed that mounts grow when a Gnome or Tauren is mounted, which is strange. This mount is cool in all but theres one problem,when i try to go threw some of the doors,i cant fit.I just got my Black War Tiger today and its way better.The only thing i liked about it is all the armor on it.So i dont think this is a good mount. Are there any DRAENEI that got this mount? I don't see a single one in the Screenshots. Marks of honor are removed in patch 3.3.3 and this mount will cost 50000 honor points. In patch 3.3.3 all battleground marks will be removed from the game. All leftover marks can be turned in for 185 honor via . The PvP mounts will be sold for 50,000 honor instead of marks. 90 total marks (Old way = 30 Arathi, 30 Warsong, 30 Alterac) x 185 each = 16650 Honor under the new system. If you're close, I'd try to finish up before 3.3.3. This mount can be bought ( for 50,000 Honor as mentionned above) right outside Champion's Hall in Stormwind. Note that Lieutenant Karter has moved from inside to right outside the door. Dose it transfer to some thing if you switch to horde? Yes, mounts scale with character size. You can see why when you have the Hyldnir buff while riding a gryphon (in which case your mount does not scale to your new size). The poor creature is so small in comparison, it looks like it could die from trying to keep you both aloft! What does a Worgen look on this mount? im thinking of getting it for mine. 2k honor isnt bad for this mount i cant wait to get this on my human paladin! There are six mounts you can buy, for 2000 Honor each. (no rep required). Goes very well with my low-level Lightforged Draenei Paladin.